October 16, 2009- The ConnectEDU Cares program, an initiative at ConnectEDU designed to improve the physical, mental, and social well-being of our team members while educating and supporting one another on the path to a happier and healthier lifestyle, is making an impact on the local community. In addition to encouraging our team members to help one another, ConnectEDU Cares reaches out to our community to impact those initiatives important to us. 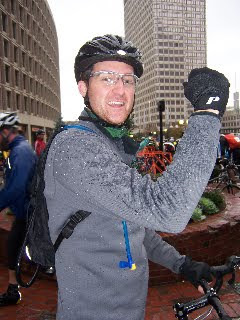 Recently, ConnectEDU team members registered for Hub on Wheels and completed a 50 mile bike ride. 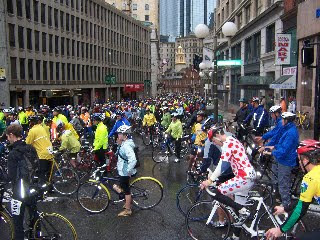 On Sunday, September 27th, ConnectEDU’s Andrew Morrison and Erik Peterson participated in the 50 mile bike ride across Boston in the pouring rain to raise over $500 for classroom technology within the Boston Public Schools. And I am told only one flat tire along the way! 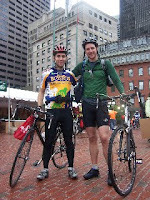 Andrew and Erik were among over four thousand riders, and more than four hundred volunteers that came together to raise the most money to date for the Technology Goes Home program, helping Boston Public School students get the technology and skills they need to succeed in today's world. Technology Goes Home (TGH) has served over 3,500 families through the BPS and community programs during a nine year period. The TGH program, while teaching technology skills to underprivileged families, brings students, parents, and teachers together at school in an atmosphere that fosters trust and community building, particularly between parents and teachers. Congratulations to Andrew and Erik for continuing ConnectEDU’s mission outside the office to help young people effectively use technology to maximize their college and career potential. We’ll continue to keep you updated on the efforts and accomplishments of ConnectEDU Cares throughout the year.